INTEGRATED CONTACT TRACKING: This is the kind of system you need as you grow. If many people in your organization talk to your repeat valued clients but don't have time to tell each other what happened, then you need a system like this one. Transform your Sales Force The Perfect Upgrade for ACT users, over 50% of our customers were once using ACT. True Sales Management with full security at all levels. 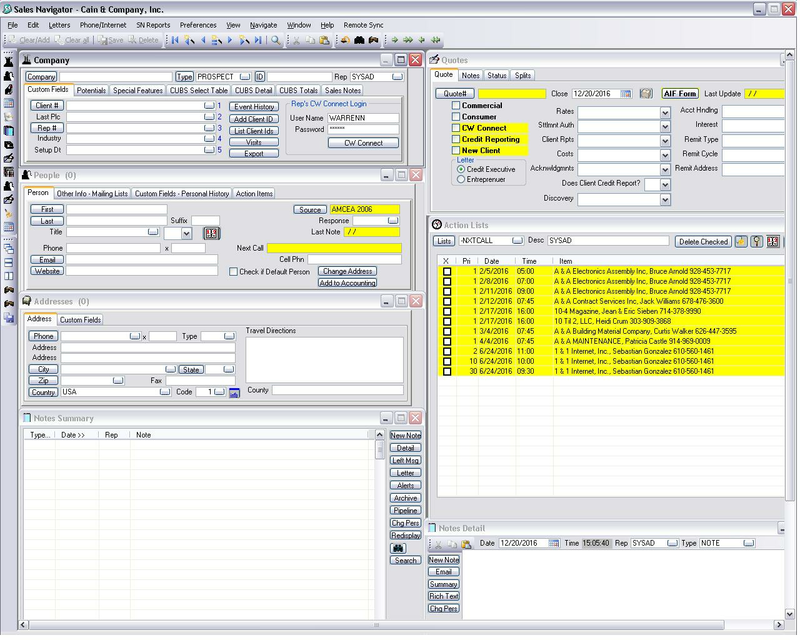 Free Database system included, but we also support SQL, Oracle, MySQL, and Pervasive Btrieve databases. We do customizations! We take our great Sales front end and integrate your particular systems by modifying one or two views. Track each of your contact's past activities using Action Item Ticklers to track Follow-up activities and Calendar events. Detail Accounts with many custom fields with custom selection lists like Lead sources, Response Types, Sales Cycles, Interest Levels, and Pipelines. Track Opportunities, Monitor Sales Forecasts, Write Proposals, and a Full Product Catalog w/ 9 Price levels. Fully Integrated with Order Entry and Customer Service modules so you can track Service calls, write RMAs, and have your salespeople enter their own orders and much more. Multi-Site synchronization, Tie your fields reps in without putting your data in someone else's hands. Now with WebNav, you can put your reps anywhere with access to their information 24/7 with just a wi-fi connection. Supports just about any device. Close more deals. Enhance your Customer Relationships. Access your key contact information anywhere, anytime. Streamline your sales and service processes. Establish consistent and collaborative customer management. Improve productivity by trimming administrative tasks. Shorten ramp-up time for new reps. Simple and easy to use, but not short on the features. Unique screen and view setups allow new users a simple screen and advanced users advanced screens. We can customize this software for your companies needs with personalized service. Don't wait on the phone for technical help...let us give you one on one care. We take good care of our customers! Unique, one of kind Seagate Crystal Report Writer interfaces. Since 1983, SalesNav Sales Management Tools has been helping companies like yours get a handle on what their salespeople are doing on a daily basis, in or out of the office. Whether you are trying to hone your sales cycles, get a high level picture of your sales pipeline or a production forecast for your manufacturing efforts based on real empirical data, SalesNav is the answer. SalesNav is the next logical step for many companies who have learned that products like Symantec's ACT can't meet the demands of a growing sales force. SalesNav is designed to help you grow from just a few salespeople to hundreds with a clear growth path. This is one of the ONLY affordable sales packages on the market that includes proposals, sales orders, and incident and RMA tracking and now WebNav. THIS IS THE MOST POWERFUL SALES MANAGEMENT TOOL ON THE MARKET ANYWHERE NEAR THIS INVESTMENT VALUE! This is the Ultimate in Sales Force Automation software. No matter what size company you are today, this software will grow with you. Tie multiple physical sites and salespeople on laptops together. If you have already ACT sales software today you are having trouble managing your salespeople, this is exactly what you are looking for. Copyright © 2017. Designed by Phillips Software.